We also carry Alligare Fluridone, a new generic formulation that is a lower cost alternative offering our customers the choices they deserve. This has been our # 1 Pond seller for the control of submerged weeds and floating duckweed. Systemic action can control plants all season by killing the roots. 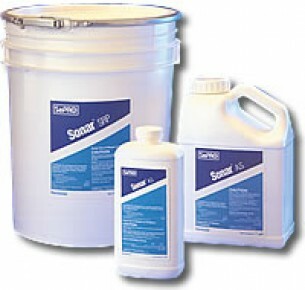 Sonar is a concentrated product; a few ounces for a small pond can keep the weeds out all summer. Sonar is very thorough and will move throughout the pond for excellent widespread control. Sonar should not be used for spot treating. No fishing or swimming restrictions. Rates below assume Duckweed is present – many submerged weeds can be controlled at much lower rates. We recommend the liquid formulation for duckweed and watermeal applications. Also see the easy to apply Sonar pellets! Formulation: Liquid - Quick release pellets also available. The Sonar Liquid Product Label is available for download in pdf.